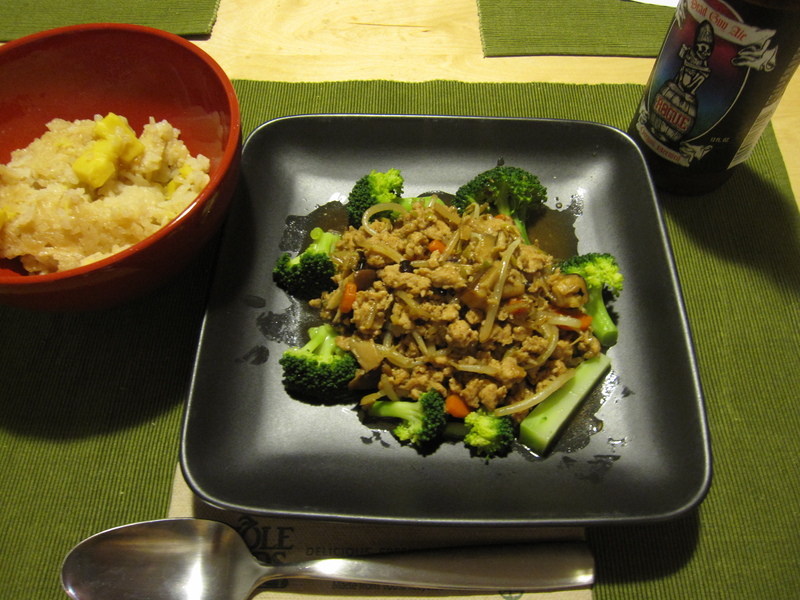 For dinner last night I made a simple Chinese-flavored ground chicken stir-fry. For the sauce, I used fermented black bean and garlic sauce. It’s a real easy way to get a lot of flavor into a quick, healthy dish. 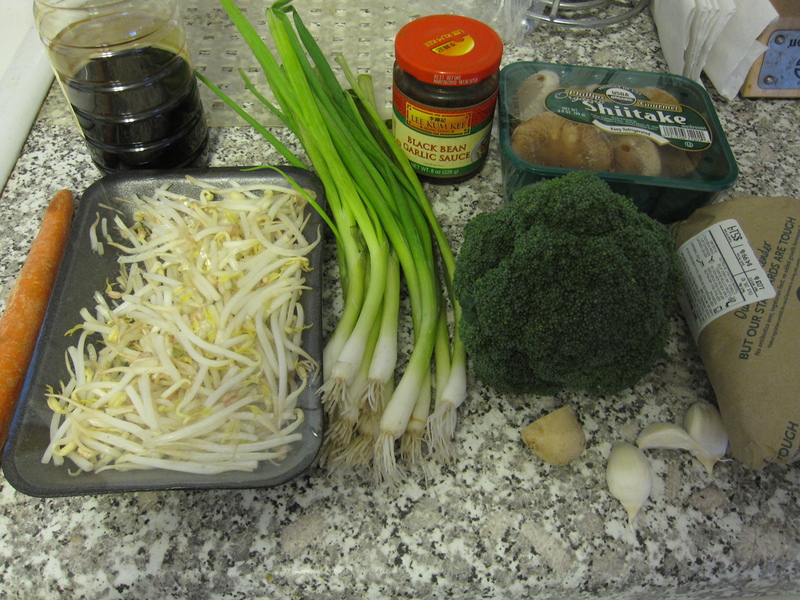 My ingredients included 1 carrot cut into half moons, 1/2 pound bean sprouts, 2 tablespoons soy sauce, 10 green onions thinly sliced, 3 tablespoons of black bean and garlic sauce, a package of shiitake diced, 1 head of broccoli cut into florets, 1/2 inch ginger, minced, 3 cloves garlic minced, and 1 pound of ground chicken thigh. First thing I did was to mix up the sauce. In a small dish I mixed the soy and black bean sauce. After tasting it, I decided to add a little sweetness so I mixed in 1 tablespoon of mirin. 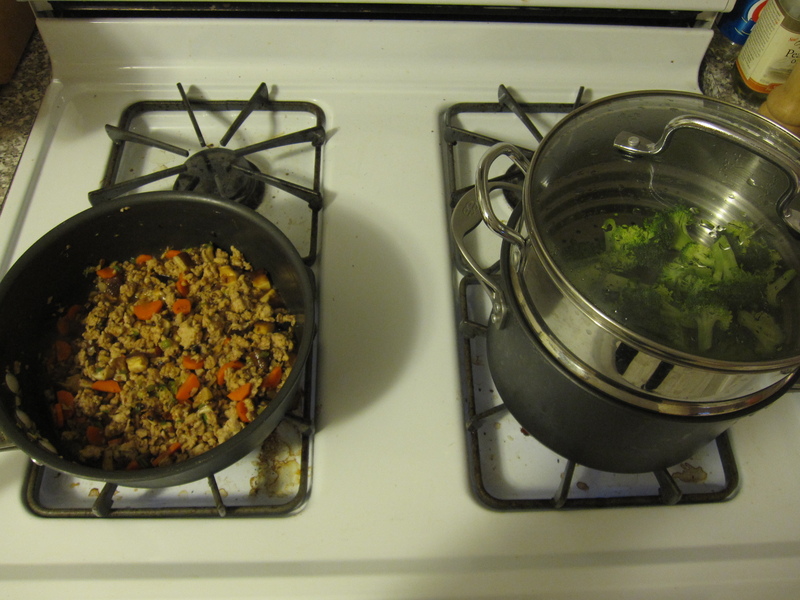 I set that aside and heated up a saute pan. Once hot, I poured in about 2 tablespoons of sesame oil and then added the ginger and garlic. I let them sizzle for about 30 seconds and then added the carrot and green onions. I sautéed them for about 3 minutes and then added the chicken. I broke up the chicken as it cooked for about 7 or 8 minutes and then added the shiitake. Once the shiitake were coated with the rest of the ingredients I added the sauce and mixed it around. At this time I put the broccoli into my steamer. Broccoli only needs about 4 minutes to steam to a nice al dente and at this point all I need to do with the stir-fry was let the sauce boil down a little and add some pepper and the bean sprouts. So, that’s what I did. Easy as that. The other day Yuki had made some sweet potato rice that we didn’t finish. Instead of making new rice I decided to use that up. White rice probably would have matched better with the slightly salty dish, but the sweetness of the sweet potatoes wasn’t that bad of a match, and it added a higher nutritional value to the meal. So did my beer.